I received the Grifos Nero Muse Bog Oak Wood that I bought on Massdrop. Only after receiving this pen did I realise that I had completely wasted almost SGD 200. The pen is made of 5000 year old wood and has sterling silver accents, which are nice I admit. The shape, design and weight of the pen are also pleasing. But what really irritates me is that the nib writes worse than my Pilot Metropolitan. I have 3 other pens in my collection, excluding the Grifos, a Pelikan M200, an old Sheaffer and the Pilot. The Grifos is not only the most expensive of the bunch, but also the worst. The threads on this pen are so badly made, you can hear it scratching against itself. But leaving that aside for now, the nib on this pen is diabolical. It has hard starts, a ridiculously dry writing and writes like a European Medium, although it is a fine. The only plus is that it's pretty smooth. I really get no pleasure in thrash talking about this pen but this is my final resort before I ship it back to Italy or Massdrop. Is there anything I can do about the nib? Anything to make it write? As I said it isn't a smoothness problem. 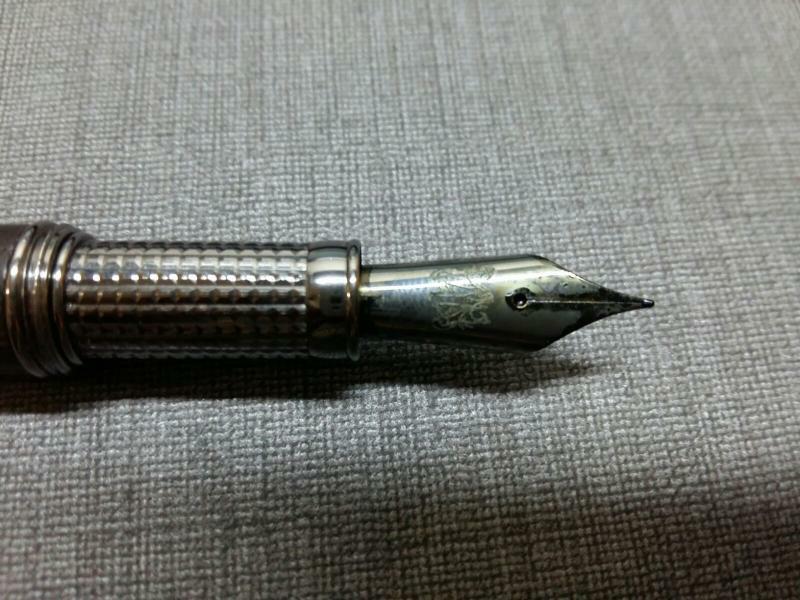 Is it possible to swap out the nib? 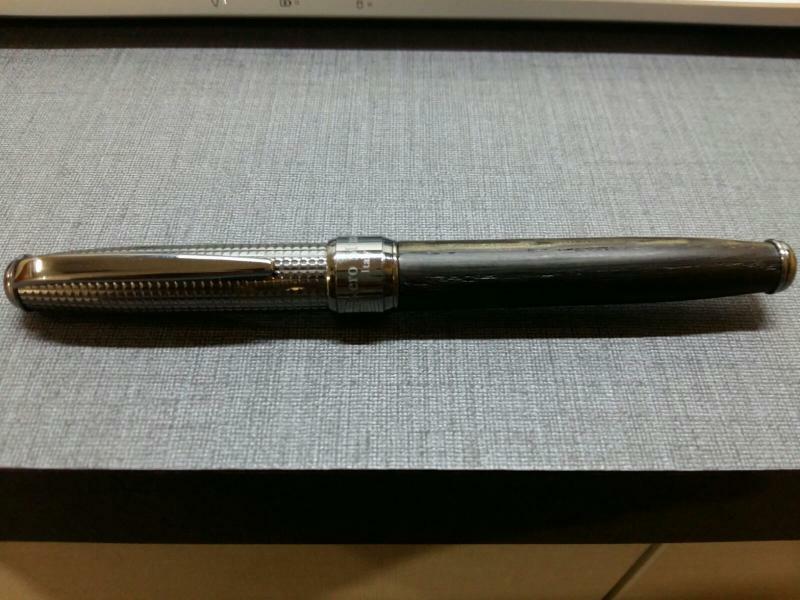 Can I replace the entire grip section and nib? If so, please give me a few suggestions. Or is it just cheaper to send it back? Any help or advise is appreciated. There are two main issues that could cause the hard starts; the inner cap not sealing or a surface tension issue so you need to determine which is the most likely cause. To test, if you were using the converter switch to a cartridge and see if the problem goes away. If that works come back here and we can go one to the next step. Thank you jar for the advice. I tried it and there is no hope. The nib is still terrible. Any idea if another section fits in this pen? I first received another nib from Grifos, but I decided to swap it for a nib from Goulets' that I knew I liked. I had never "pulled a nib out of the feed before" but when I was instructed to do so by the owner who had sent me the first replacement nib, I did as he suggested & the nib slipped out fine. I used a small piece of leather to grip the nib & feed, then centered the new nib over the feed & replaced it. I have been happy with my pen ever since replacing the nib. Okay, so let's go to the next step. The owner of Grifos is a member here, stubnib. Contact him and ask his advice. Be sure to explain fully what is happening, when it is hard to start. Show samples if possible. "...I get no pleasure trash talking about this pen but this is my final resort..."
Have you emailed Maurizio Stura, the owner of Grifos, about the problems you are having? Besides being an FPN member, he is a very responsible businessman and would want you to be satisfied with your pen. 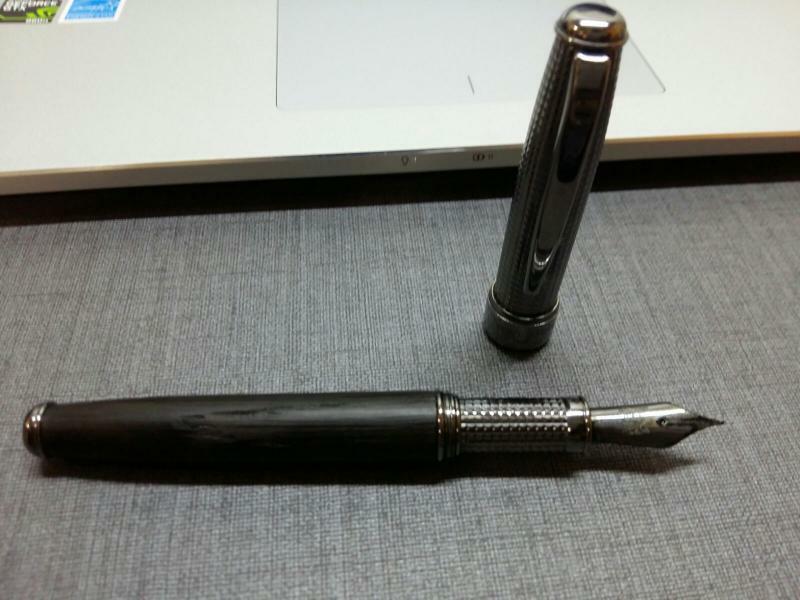 I also bought the ancient bog oak and silver pen during the Massdrop buy and it is one of the best writing pens I own. Maurizio has stated both at Massdrop and on his website that the Bock nibs he uses run wider than typical European nibs. Regardless, if you are dissatisfied with the nib's behavior or the pens threading, I think you would do well to take your concerns to Mr. Stura. If you've already done that without satisfaction, then I understand your frustration. If not, then the forum is not your final resort. Thank you all for your kind advise. I am speaking to Massdrop about the issue. Will update this. Hopefully it's just a nib problem. An M nib....Bock or Western, is a great nib for shading inks.....something someone who uses only EF western or Japanese F or narrower....wouldn't know much about....in IMO such narrow nibs just don't have the width to shade will. In Bock makes the nibs for the majority of the European pen makers....I'd not take wider than European as gospel. Parker?????? Don't know for sure, would think so, in Parker and Waterman belong to the same company....but it is something I don't know for sure. MB, Pelikan, Lamy are "reputed"***** to be wide nibs.... Aurora and Waterman narrow, with Aurora the narrowest European nib....almost as narrow as the miss marked Japaneses nibs. The rest will be Jo-Wo or Bock. Odd how no one mentions modern Parker or Waterman when speaking of European nibs....or even Western. It could be that Jo-Wo is thinner than Bock.....How ever if you order Bock 5,000 nibs you can have narrower I bet. Mark all the EF's, F like the Japanese do. **** Pelikan and MB is wider than they use to be (blame it on the ham fisted ball point barbarian invasion).....I don't know if Lamy is....In I've not seen any lump of 'iridium' double ball on the only modern ones I've looked at, Safari, Cpm-1, Imporium. I've not checked my Lamys vs others....not feeling it worth while in I have 1.5 Joy and B in the Safari, what looks B in the Cpm1 and the old Persona that is now a CI was an OB.....I really don't worry much about how wide my Lamy's are. It is my opinion, many who complain about how wide European nibs are.....are at fault for comparing apples with pineapples. In Japanese false marked nibs were their first.....so they think that a Japanese F is F and a European F is fat. They are wrong.....Even if you are Japanese, your nibs are false marked for your local market only. Japanese pens were nitch pens until the late 1990's. They are wise business men....offering a good cheap pen for 'noobies'. Who have their Mark Two Eyeball calibrated to Japanese too narrow marked nibs. Japanese nibs are made for a tiny printed script. Western nibs are made for a larger flowing cursive script....and were first to set up "standards" to what was @ Wide, Medium & Narrow, before Japan started making fountain pens in 1912. There were different often slightly over lapping standards between western companies. Same with Japanese companies one is skinner, the other fatter. Sailor is the Japanese fat nib.....could be near as fat as an Aurora.....Pilot is the skinny Japanese nib. I had my Mark 1 Eyeball calibrated to Western nibs many decades ago before anyone every heard of a Japanese pen..... The first Japanese pen I ever saw was a late '60s-70's Sheaffer.....and it had the normal for then, Sheaffer thin nib. Do buy vintage '50-65 Pelikan, MB, Osmia, Geha for a narrower width than modern (also a hell of a better nib).....actually with Pelikan up to '97 you get a nib @ 1/2 a width narrower than modern Pelikan. How much narrower is a Fat Sailor to a semi-vintage narrow Pelikan? Edited by Bo Bo Olson, 08 November 2016 - 16:06. Thank you Bo Bo Olson for your advise. I'll take note of that. And props for taking the time to explain. The thing to think of is. are you going to be printing in tiny Japanese script mostly with the nib ? (EF western= @** F Japanese) Or writing the larger flowing cursive (F western =@** M Japanese). Do you want to enjoy shading inks? Then F....and you can print with F....and often printing gives even more shading than cursive. F will be smoother. **@......all nibs are only @......first there is the fact that every company has it's very own standards, based on their customer survey....from who knows when. A company back in the old days of One Man, One Pen, & the corner pen shop; listened to it's customer and trained him to what they thought he wanted. Parker made a wider nib than Sheaffer. If Parker made narrower nibs that their customers could become confused and buy a Sheaffer. Same for Sheaffer making a wider nib. Then there is the normal slop/tolerance. Now we get into Slop/Tolerence....that even Japanese nibs have. Until there is 100% robots making nibs, there will always be variance. Pinned over in the Sheaffer forum is a great article from Ron Zorn, who got to Sheaffer's Ft. Madison factory just as it closed. He saw the nib tip measuring guage. A Fat F could = a Skinny M exactly....depending on the mood of the man making the measurements. Then you have next, a nib that was 1/100's of an inch closer in, and so on. Passing through the middle of Tolerance to the other edge. Sheaffer used a dial indicator nib gauge for measuring nib sizes. The nib was inserted into the gauge, and the size read off of the dial. A given size being nibs that fell within a given range. What is listed below were the ranges given on a gauge that I saw in the Sheaffer service center prior to being closed in March 2008. Measurements are in thousandths of an inch. *there was some overlap on the gauge. May be 0.035 - 0.050. Even nibs 'marked 1.5 or 1.0 or what ever you want to mark them with....not that I have the slightest idea if a 0.5 is medium or fine....there will be slop there too. An "0.5 could be 0.6 or 0.4 and still be with in tolerance. Unless you are at the shop checking out the widths of same marked nibs.....you have to take pot luck with your nib width......unless you want your nib ground to exactly your tolerance...which will be yours....not mine nor your friend. You can get a nib made skinnier easier than fatter. So to expect a nib to give you what you think that marking should be.....is wishful thinking. You can luck out or get a 'fatter nib'......and I find it always so 'funny' no one complains about a nib too thin your M that = an F. It's always a F that = a M.
If one thinks all nibs are 1/2 size or more off...when or when not comparing cross companies ....then it's not a problem. Nibs are always only going to be horseshoe or hand grenade close....even if you take the very next pen off the assembly line in that 'size'. There will be fat, middling and skinny to tolerance Sailor and Pilot nibs also....it is not a western phenomena. It is universal. With Pilot being on the whole thinner than Sailor which has it's very own standard. Does the nib write well?....good. Put it in your wide, middling or skinny cup and don't 'sweat the small stuff'. Edited by Bo Bo Olson, 09 November 2016 - 20:53. We made handmade pens and some problem sometime happen and we are always attentive to fix them as stated here below from other members so why you have not done the most easy thing as drop me few lines and explain you problem? @ Infianelf: 10 months later them my previous post here about I'm still awaiting you contact me to fix the problem if any, but no reply from you... As any serious company we are available to fix customer problems but sure a small amount of collaboration must be from you side too. So if you have find the time to make the right complain please spend half of that time to contact me here or trough our email ( info@grifos-pens.it) . This would be usefull to you and fair toward us. Perhaps the gods arent happy that someone took the oak out of their bog, and theyve laid a curse on all the stuff made from it. I recommend you consult your local shaman. Edited by sidthecat, 04 December 2017 - 18:50. Shaman said as well that good are unhappy when customers only write their complains with any follow up with pen makers and this is the reason why his fountain pen is so troubled. Shaman said. Augh!! Well, if it's okay by your shaman it’s okay by me. The gods are fickle.